Meet Rich DeSilva, a cancer survivor and treasured member of Joe Andruzzi Foundation Marathon Team; Rich is a 42-year-old father of three from Mansfield, Mass., who serves as Director of Relationship Management at Financial Engines. This is his first time running Boston, and we’re proud he’s wearing our jersey. Thank you so much Rich, for your strength and dedication – even in the face of injury! Rich: I am a recent cancer survivor (melanoma) myself, so Joe’s story resonates with me. Knowing Joe from the soccer fields in Mansfield, I thought it would be a good opportunity to partner with an amazing foundation and turn what was a devastating personal experience for me into something positive. Rich: I recently lost a close college friend to cancer; additionally, a work colleague and friend of mine is currently battling metastatic melanoma. 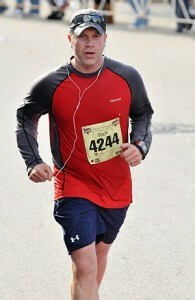 Several close friends and family members have also recently had cancer scares… I am running in their memory/honor. Rich: No, this will be what I hope is the first of many. I have run 12 half marathons. Rich: With no marathon experience, my only advice would be, when the going gets tough on Heartbreak Hill, focus on the reasons why we are doing this in the first place… for the cancer patients and their families. Rich: Running is therapeutic for me, relaxing even. I throw the headphones on and just go. There’s nothing like the high when you’re finished with a long run, provided you don’t get injured! Rich: Unfortunately, I took 7 weeks off because of a serious neck injury, so I am way behind on my training. I have done only three long runs. I am not deceiving myself; I will likely be walking several miles of this race. Rich: This winter has obviously been mild, but in general, the cold doesn’t bother me. In fact, it’s preferable to training in the heat and humidity. Once you get going, as long as your head and feet are covered, it’s comfortable. Rich: My ipod is littered with anything from the Foo Fighters and Korn to Tool and Michael Jackson. Rich: Before I injured my neck, I endeavored to finish in around 4 hours. Now? Well, I suppose it’s to cross that finish line while they are still handing out medals – and most importantly, to not be taken away on a stretcher. I’d like to see that finish line. Rich: Mainly email and Facebook. I may sponsor an event, like a Texas hold‘em tourney. Rich: We occasionally do work at the local food pantry. We’d like to get involved more.